For PIRATE FEST to continue and grow we need the support of the community through Sponsorship. What better way to be part of and benefit from this exciting event than to be a Sponsor? Not only do you get direct access to the family oriented audience that Pirate Fest delivers, but you also become part of a Community Event. Your audience and patrons see you as a community involved business, a friend of the community. Most importantly you will have FUN!! *Comprehensive media campaign to promote event. *Directly reach your target market– wide demographics multiplies your reach. *Enhance your corporate image and increase public awareness. *Leverage your marketing dollars for greater impact by utilizing a unique, energetic and interactive atmosphere to communicate your message. *Opportunities for exclusivity and ownership of major festival components. 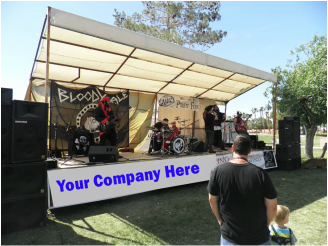 There are several naming opportunities available for activities, stages or specialty acts and/or performers. Your name will be connected to the event, in all the promotion of that stage, area, or performer, signage at the site and other compensations. How about a popular entertainer sponsored by your company with constant references in their show about you?? How about a unique High Diving Pirate Show? We can make it happen! YOUR company is tied to the show, people know they are seeing this because of you!!! 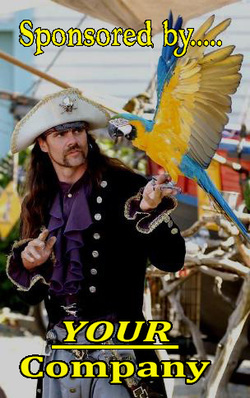 How about sponsoring the air fare for the Sail Windjammer Cruise Contest? We are giving away a cruise for two in the Caribbean aboard a real Tall Ship!!! You get mentioned in all the promotion leading up to and including at the event (this includes radio commercials). Contact us NOW and we will find the right fit for you and your company! Remember we can customize a Sponsorship. It can be a combination of monetary and in-kind donation. YOU could have naming rights to various performing stages! !